St Basil’s Cathedral in Red Square, Russia celebrates 450th anniversary! St Basil’s Cathedral is a Russian Orthodox Church located in the Red Square of Moscow, Russia and was built between 1555 and 1561. 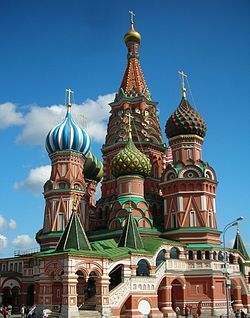 On 12th July 2011 Saint Basil’s Cathedral is celebrating its 450th anniversary. The church has been part of the Moscow Kremlin and Red Square UNESCO World Heritage Site since 1990. As part of the celebrations Russia is conducting an exhibition dedicated to the “holy fool” Saint Basil, who gave his name to the cathedral. The site of the church has been, historically, a busy marketplace between the St. Frol’s Gate of the Moscow Kremlin and the outlying posad. The cathedral is constructed to commemorate Czar Ivan’s victory over Mongol rulers, was built on the burial site where St. Basil’s body is buried. Today, March 8th the world is celebrating 100th International Women’s Day! March 8th is celebrated globally in the honor of Women. In some countries like China and Russia the Women’s Day is a Holiday! The day is celebrated with efforts to support women’s equality on a global level. People will take the occasion to recognize a woman who has made a difference in her life – whether it is a mentor, mother, sister, daughter or girlfriend.